Healthcare real estate investment trusts (REITs) are at the crossroads of some very powerful investing themes that make them a one-two punch of potential growth and extremely generous yield. Today, I want to show you a trio of these double-threat dynamos that pay secure dividends up to 7.6%. I love healthcare because it’s broadly unbeatable as a recession-proof investment. Plus the aging of the baby boomers is driving spending through the roof. Consider this: 10,000 baby boomers are reaching full retirement age every single day. No wonder, then, that the Centers for Medicare and Medicaid Services projecting that annual healthcare spend will grow 5.8% every year through 2025! And healthcare is already a powerful total return performer. Despite a rocky past year as investors have gone back and forth over how the 2016 elections were going to affect drug companies, hospitals and insurers, State Street Global Advisors’ SPDR division reports that the Health Care SPDR (XLV) still boasts 9.4% in annual total returns over the past decade – that’s nearly 2.5% better than the S&P 500 over the same period! 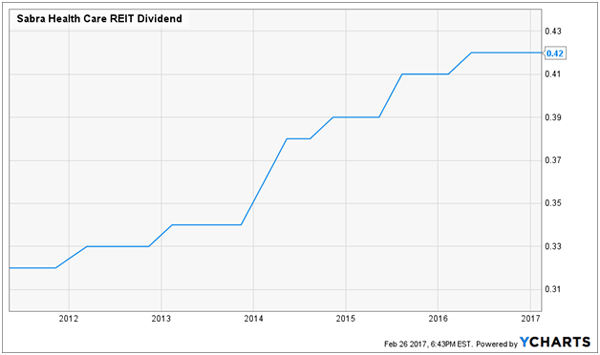 My only problem with traditional healthcare stocks is that even on the high end, the sector’s quality dividends top out in the 2% to 3% range. That’s why I love healthcare REITs, which benefit from their tax-advantaged status that requires them to distribute at least 90% of their income as shareholder dividends. These well-positioned landlords can pay double or triple the dividends that the first-level investor types flock to. Today we’ll focus on high income and payout stability. Let’s start with one of the most respected names in the space. Ventas (VTR) is one of the largest and most diverse healthcare REITs on the market, boasting a market cap of $23.6 billion and nearly 1,300 healthcare assets. It’s also one of the most balanced. No single property type makes up more than 30% of net operating income. Seniors Housing (Operating) is 29% of the portfolio by income, while Seniors Housing (NNN, or triple net lease) is 25%. Another 20% goes to medical office buildings, and the rest of the portfolio is invested in specialty hospitals, skilled nursing facilities and other properties. 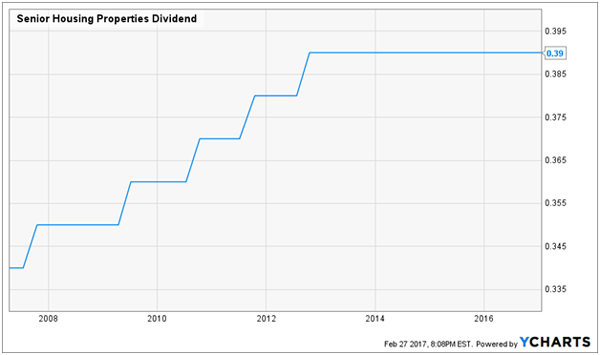 As you can see in the chart, Ventas has been growing its dividend consistently for more than a decade (the dips are due to “split dividends” that add up to a quarter’s normal payout). Moreover, Ventas pays out just 75% of normalized funds from operations (FFO), so Ventas’ nearly 5% dividend is plenty secure. Senior Housing Properties Trust (SNH) isn’t as diversified in the healthcare space as Ventas, but it does offer a much higher yield. Senior Housing Properties Trust, as the name would suggest, is keenly geared toward maximizing the opportunity from the aging of the baby boomers. Nearly 54% of its properties are senior living communities, 41% are medical office buildings, and wellness centers and skilled nursing facilities each account for about 3%. Also, SNH specifically steers its portfolio away from properties where revenues are primarily driven by Medicaid and Medicare payments, and instead, 97% of its tenants are privately paid properties. 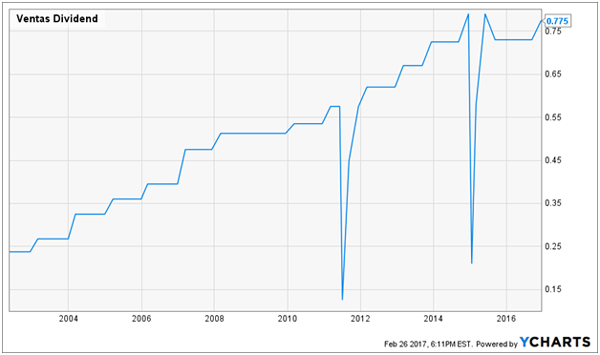 Senior Housing Properties Trust pushed its payout higher during and after the 2008-09 financial crisis, and has held its quarterly payout steady at 39 cents per share since 2013 – good for a current yield of more than 7%. As of the most recent quarter, the normalized FFO payout ratio sat at a perfectly healthy 78% (anything below 90% is generally fine for a REIT). Sabra Health Care REIT (SBRA) is a much smaller operation than the other two, at less than $2 billion in market cap. Moreover, it’s focused on senior care – of its 183 real estate properties, 97 are skilled nursing/transitional care facilities (nursing homes), 85 are senior housing facilities, and the remaining property is an acute care hospital. At the moment, Sabra is looking to make acquisitions focused around triple net leases – where the lessee/tenant is responsible for things like taxes and insurance, not just rent. SBRA has been a straight shooter since it started paying dividends in 2011, simply increasing its quarterly dole to shareholders by a little more than 30% since its original payout. Meanwhile, at 78% of AFFO, Sabra’s dividend is well outside the worry zone, meaning you don’t need to worry about this 6% yield vanishing on your watch. Note: If you’re an investor who strives to live off dividends alone, while slowly but safely increasing the value of your nest egg, these are the ideal holdings for you. Click here and I’ll explain more about my no withdrawal approach – plus I’ll share the names, tickers and buy prices of my three favorite closed-end funds for 8.2%, 9.9% and 10.1% yields.